Increased Military Activity at CFB Comox - exercises or experiments? 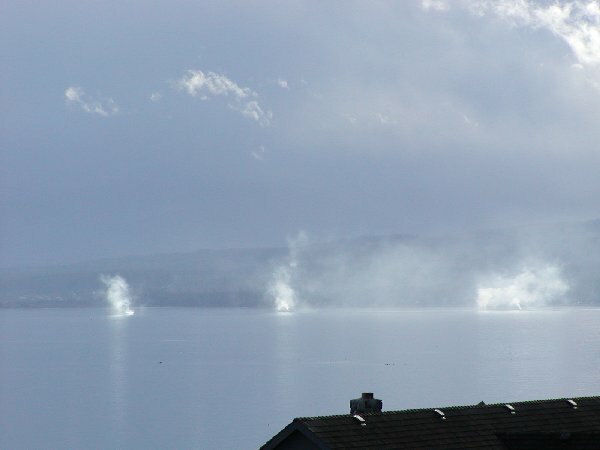 During the mid-afternoon hours of March 05/2003 at least three detonations of unknown composition were exploded off the beaches of Canadian Forces Base Comox. The public was not informed that any detonations were going to take place. Many residents of the area say that they have never seen such occurrences before in the waters of Point Holmes. Some people were alarmed to witness the masses of smoke which billowed from three separate locations, all relatively close to each other. The smoke poured from the three areas for approximately half an hour, leaving absolutely no visible traces behind afterward. One speedboat circled the general area of the explosions for a brief period of time before jetting away from the scene. No other crafts were seen anywhere near the area, and no emergency personnel seemed to be dispatched to control the problem. Some speculate that Canada is stepping up it's readiness for war due to U.S. pressure. Some others ask the question: Is this some kind of chemical or biological experiment being carried out behind the backs of Comox Valley residents? And was the recent outbreak of what was referred to as a "Norwalk-type virus" in at least two local schools very near the military base connected to the increased military exercises? One school was forced to take emergency measures by closing it's doors due to this "Norwalk-Type virus" having infected upwards of 200 students at one time. Relaxedly health officials described the outbreak as a Nowalk-Type Virus without ever having confirmed it definitively. Some might say that their laxadaisy attitude while hundreds of students are ill and schools are closed, is bizarre at best, and deceptively dangerous at worst!